Crippling poverty, lack of health care and education, and profound gender inequality affect the lives of thousands in this predominantly agricultural region of Ethiopia. Hawassa (also spelled Awasa) is the capital of the Southern Nations, Nationalities and Peoples Region (SNNPR) and has a population of roughly 259,000. The city is located on the shores of Lake Awasa and fishing, as well as subsistence farming, are the main sources of income for the local population. But for the majority, life is a daily struggle. Poverty is severe and most Ethiopians live off less than one dollar per day. The effects of poverty permeate all levels of society, but children are the hardest hit. Mothers often have to return to work when their babies are just a few months old, so babies are not sufficiently weaned. Of the infants between the ages of twelve to 23 months, 60 per cent show signs of stunting (below age-appropriate height). Health care is also not widely available, especially in rural areas. Only around 20 per cent of children below the age of two are vaccinated against common infectious diseases. Infant mortality is high in SNNPR, at 85 per 1,000 live births, and the under-five mortality rate is even higher, with 142 out of 1,000 children never reaching their fifth birthday. Another serious health concern in the region is the high prevalence of HIV/AIDS. An estimated 1.3 million people in Ethiopia are living with HIV (est. 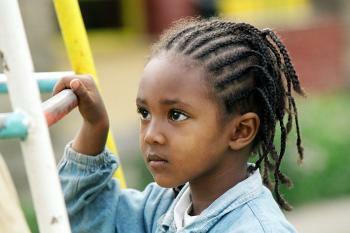 2009) and tens of thousands of children have been orphaned by AIDS. The majority of people living with HIV continue to be women between the ages of 15 and 24. In SNNPR, only around 11 per cent of women use contraception. SOS Children’s Villages began its work in Hawassa in 1985. Today, our social centres here provide a family strengthening programme to members of the local community. The programme aims to help parents develop their capacities in a holistic and sustainable manner, to achieve self-reliance and economic autonomy, and to ensure access to essential services such as health care and education. We assist parents in sending their children to government-run schools, and provide guidance on income-generating activities as well as counselling and psychological support. The social centres also offer day-care, where up to 150 children are looked after, fed, and taught simple literacy and numeracy skills while their parents are at work. The overarching aim of these services is to support families, and the community as a whole, so that children can be protected and cared for and will not be abandoned. Our medical centre here is also open to the community and serves approximately 8,000 patients each year. Amongst others, it provides the following services: consultation and treatment, minor surgery, vaccination, family planning services, ante/post natal care, voluntary HIV testing, and health education. Together with children from the community, they attend the SOS Kindergarten here in Hawassa. This way, children from SOS families are integrated into the community from a young age. The children then continue their education at the SOS Hermann Gmeiner School, which offers primary and secondary school education to around 960 students. In addition, the children also have the opportunity to obtain an IGCSE, which is an internationally recognised qualification for school students. When young people from the children’s village reach an age where they feel ready to move out of the family home, the SOS Youth Programme makes shared accommodation available to them while they complete their education or vocational training. With the support of qualified counsellors, the young people learn to take responsibility, plan for their future and prepare for independent adult life. The SOS Vocational Training Centre here in Hawassa offers young people, including those with special needs, from all around Ethiopia the chance to complete training in dairy, poultry and livestock farming and fruit and vegetable cultivation.